5.0 out of 5 starsA wonderful, hard to put down read! What a wonderful book! My daughter and I are reading it together and are both enjoying every page! What a sensational read, heartbreaking at times, but very rewarding. 5.0 out of 5 starsGreat middle-grade family story -- with a Jurassic twist! Eric Walters’s ELEPHANT SECRET is a gripping family story with an environmental spin. Thirteen-year-old Samantha Gray has lived her entire life on an elephant sanctuary owned by her father. Her mother died when she was born, so her only family has been her father and the elephants – an amazing herd of creatures who are more caring, loving, courageous, and loyal than most humans. When one of the elephants – a gentle soul named Daisy Mae – gives birth to a very unusual baby, Samantha’s world is turned upside down. Suddenly, an eccentric billionaire enters the picture, with designs on the baby. And Samantha’s life with her beloved elephants might never be the same. The novel is being compared to Michael Crichton’s JURASSIC PARK, and there are similarities. Cloning plays a part in this novel, as well as long-extinct animals. And Walters’s eccentric billionaire is a bit like Crichton’s John Hammond, the power behind the resurrection of the dinosaurs (both seem like the proverbial kid-in-a-candy-store when it comes to reanimating extinct animals, and with both there’s a subtle suggestion of something shadier beneath the surface). That said, ELEPHANT SECRET isn’t really about cloning or resurrecting extinct creatures. It’s really about family – about Samantha and her father and the elephants they have both come to love as essential parts of their lives. There’s a lot here about how elephants are mistreated in today’s world, and how hard it is for them to recover from abuse and neglect. The elephants living on the Grays’ sanctuary have never lived in the wild; they were born and raised in zoos or circuses or carnivals where they were trained to do tricks. Once on the sanctuary, they formed bonds with each other and with Samantha and her father, bonds that link them all as family. Samantha understands these elephants. She can read their emotions, and she can communicate with some of them in ways that seem unbelievable. When the very unusual baby is born, Samantha becomes her mother, feeding her countless bottles of formula, helping to keep her safe during storms, and protecting her from potential dangers. Their bond is strong, even stronger than Samantha’s bond with the rest of the herd. But Samantha does come to realize that she can have human friends, even her father’s girlfriend (a lawyer Samantha at first can’t accept). In some ways, the elephants themselves pave the way for Samantha to grow closer to her father and her friends. These really are amazing animals who share many human qualities, including the need to grieve over lost loved ones. I really loved reading this book. Obviously, I’m not Walters’s target audience, but I can easily see how my own sons would have loved this book when they were in middle school. Samantha is a great character, and the elephants are wonderful creatures, each with his or her own personality (I loved mischievous “teenager” Raja who spars with Samantha in the pond and regal matriarch Trixie who rules the herd with grace and compassion). This isn’t an action-packed adventure story, but it is a beautifully written tale about love, family, and our responsibility to all living things on our planet. 4.0 out of 5 starsNo Secret: This book is great! --- "Samantha, or Sam, has her own perfect life. She and her dad live in and own an Elephant Sanctuary, with their "Family" of elephants. They know every elephant well, and enjoy their time with them. Though they are short on money, they are happy. Sam's dad has a new girlfriend -- a lawyer. She makes Sam's dad really happy, and she's been around longer than most previous girlfriends; but Sam does not like her. In time, though, she starts to. The girlfriend gives her a beauty treatment for the 8th grade dance, and a new dress. While at the dance, Sam finds out that one of their elephants is having a baby! She rushes home to the sanctuary, where two new doctors are helping to birth the premature elephant. She comforts the fading mother elephant, and promises to watch her baby for her. The mother dies, but the baby is born. Sam gets to name it -- and she decides on Woolly. Later, she meets the man who funded the impregnated elephant -- and he explains that Woolly IS a Woolly Mammoth! The rich man will fund them, and do anything necessary to make sure that Woolly is safe and happy. Sam, being Woolly's favorite person, now has a lot of responsibility. How will things turn out for her? Find out in this great book! I really liked this fun, touching family story. Before reading this, I wasn't particularly attached to elephants, but it made me really appreciate them and look at them differently. I loved that all the elephants had different, cute personalities. They were lovable and caring. The book had me laughing and crying and guessing -- while cheering on the awesome characters and hoping for a happy ending. My favorite part of the book was the love and friendship between Sam and the elephants, especially between her and Woolly. I would definitely recommend this book to any of my fellow animal-lovers!" 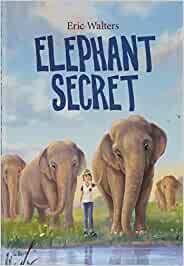 Eric Walters's "Elephant Secret" is the story of a young girl who lives on a elephant sanctuary with her father. Like many of these sanctuaries, it needs money to keep going and the offer that Samantha's father gets is one piece of the plot. Perhaps one of the more interesting pieces of an otherwise nice but slow moving story. Samantha is 13 years old and capable within her world. Her father, Jack, is a good man with reasonable flaws. In addition to the challenges of running the sanctuary, there is a new woman, Joyce, who is a lawyer, a volunteer at the sanctuary, and a possible love interest for Samantha's father. So there's a bit of family drama, the environmental angle with the elephant herd, and the scientific with the breeding aspects (don't want to give anything away). I have to admit that I found the elephant/science angle the most interesting while the rest was a bit forced. I think this story is appropriate for the 10 to 12 age range that it is intended although there are some parts that a parent or guardian may want to take a peek in case there are questions. As noted, the pacing is slow and maybe a bit boring, but overall, it is a nice story.